UNHCR and partners register new refugees arriving from Central African Republic (CAR) in the Chadian village of Mini, one of the three locations near the borders hosting new arrivals since 12 June 2016. The United Nations refugee agency today said that more than six thousand people from the Central African Republic (CAR) have fled into Chad and Cameroon to escape renewed tension and violent clashes since mid-June. “Refugees arriving in the two neighbouring countries, which already host tens of thousands of refugees from CAR, said they had seen killings, kidnappings, looting and the torching of their homes,” Melissa Fleming, spokesperson for the Office of the UN High Commissioner for Refugees (UNHCR) told the regular press briefing in Geneva. The exodus from CAR began on 12 June when clashes erupted between livestock herders and local arable farmers in and around the north-west town of Ngaoundaye, Ouham Pende region. Thus far, more than 5,643 refugees have been registered in the villages of Sourouh and Mini in southern Chad. Screening and registration of new arrivals is continuing. A further 555 refugees have crossed to Yamba village in eastern Cameroon. The fighting this year has also affected a further 25,000 to 30,000 people within CAR, including many internally displaced in addition to those fleeing. She further said that while most of those seeking refuge are women, children and the elderly, more men are fleeing and leaving behind their livelihoods. In Chad, where people have been crossing despite the border being officially closed, about two thirds of arrivals were under 18 years of age and 450 of them unaccompanied or separated from their families. UNHCR protection staff identified more than 20 per cent of those arriving as vulnerable with specific needs. Some had health problems, including malaria, respiratory infections and malnutrition. “They are arriving in a poor state; exhausted, weak and hungry with many traumatized. These people, crammed into structures provided by the village host community, need urgent aid, including shelter, food and medical care,” added the UNHCR spokesperson. The latest violence comes barely six months after the election of President Faustin Archange Touadera ushered in hopes of lasting peace after three years of escalated conflict that left thousands dead and almost one million displaced. The spokesperson said that UNHCR and the governments are working with partners to provide emergency assistance to the new arrivals while preparing to relocate the new arrivals to host villages some distance from the border, rather than create new camps. “When these host villages are ready and people relocated, starting next week, UNHCR and its partners will provide basic social services to the refugees and host communities and encourage integration,” said Ms. Fleming. The arrival, since mid-June, of refugees in Cameroon followed an influx in late April of 716 people. About 70 per cent of the CAR refugees in Cameroon live in host communities and 30 per cent live at refugee sites. On the agency’s assistance programmes, Ms. Fleming said that prior the new influx, UNHCR and its partners were providing protection and assistance to over 67,000 CAR refugees in southern Chad and some 260,000 in Cameroon. She further said that there are about 415,000 internally displaced people within CAR. UNHCR has appealed for $225.5 million for its CAR operations but has only received $24.7 million – about 11 per cent – to date. 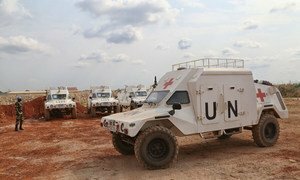 The United Nations human rights chief today warned that the security and human rights situation in the Central African Republic (CAR) may be starting to deteriorate again, after a series a major incidents in the capital of Bangui and rural areas.